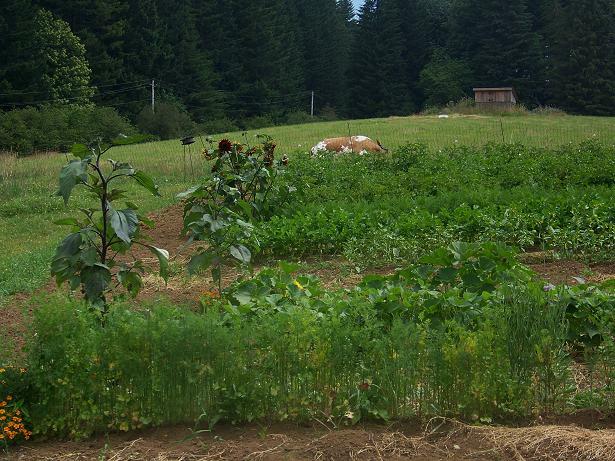 The hay is in, I am kinda, sorta caught up on my weeding, and the weather is divine. Apologies to those getting their hay wet, and to those who are suffering a heat wave. My morning started out with a jolt, cows bellering. Wait, your foggy brain thinks that sounds close. You sit bolt upright in bed and listen to see how close they are. No worries about listening, they are all standing at the gate in the hayfield wanting you to come out and see how good they grazed the barely recovered orchard grass in the orchard, and while they were at it, they nipped the new grass in the corral too 😦 Grrrrr. I hate to admit it, but me chasing cows before I have run at least one french press worth of java through my veins is not a pretty sight. Plus cows stuffed like ticks, on a cool, Pacific Northwest onshore flow morning, are like children after a birthday party wound up on sugar. Goofy and hard to manage. Long story short, we put them back in, fixed the fence (deer) and the rest of the morning was a pinch me summer morning. 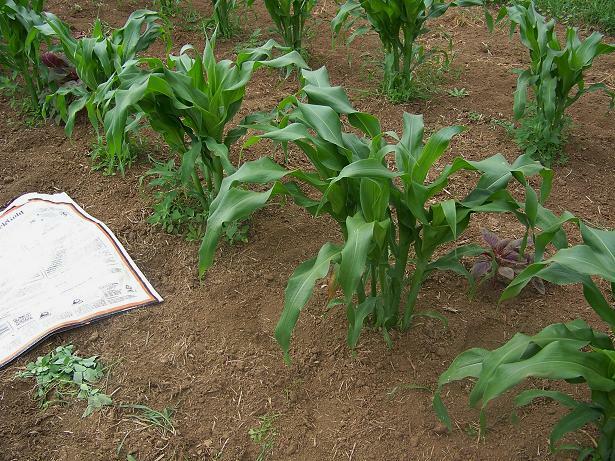 I got my corn patch hoed and hand weeded, and caught Jane taking her morning nap. Looking VERY good! 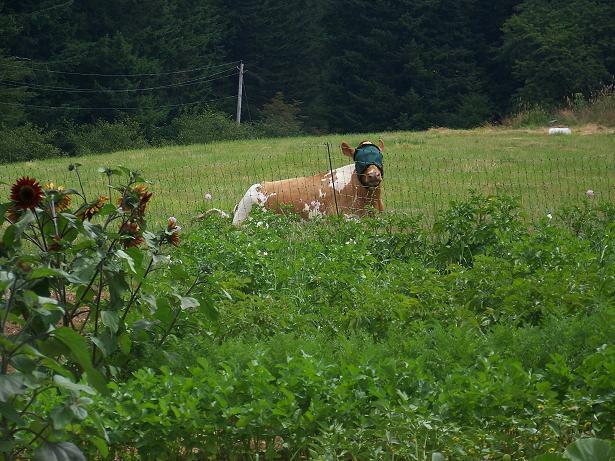 Love that you put a fly mask on your cow :-). TCSL, Nothing like a weeded garden! It took a few days for Jane to realize that fly mask was a good thing, now she expects it before she heads out to the pasture. Oh, how I love a freshly weeded garden!…it looks wonderful! 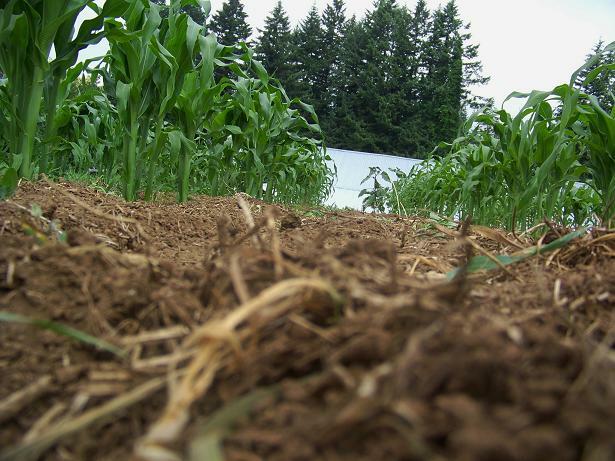 Your corn is planted differently-how do you plant yours? I enjoy following your blog…wishing one day for a milk cow of my own! 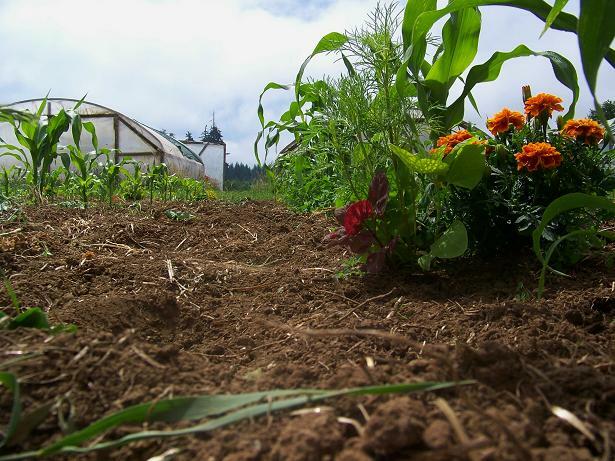 Margie, I know, seeing the weeds dying is a good feeling 🙂 I always plant corn in hills, 3 – 4 plants per hill, with hills spaced about 18″ apart. It makes for easy hoeing, and anything I can hoe I don’t have to hand weed. Around here hills are the same as what some folks call stations. Basically just a group. I plant onions the same way for easy of cultivation and harvesting. Darn deer! I hope you have more “pinch me” days in your near future! Me too! I think last night was goofy night in the pasture! We’re getting our hay put up this week as well. It’s a lovely feeling. Also lovely is hiring a guy with a stacker. Watching him pick up and stack ~100 bales from field to barn in just slightly more time than it takes me to fill a stock tank with a hose really makes me appreciate that particular piece of equipment. The gardens, unfortunately, are being deferred this year because of logistics around the move. Garth, you’ll get to handle those bales this winter – may as well have the machine put it in the barn for you! Well, at least it wasn’t a stranger coming to your door to ask if you knew who owned the cows grazing the roadside. I got ’em back yesterday for waking me up! I forgot my camera and walked back to the house to get it, of course, this was after building the paddock. The minute I ducked under the fence, I could hear moos with question marks at the end. Mooo? It would have taken too long to explain that I needed to get a photo of that grass before trampling.